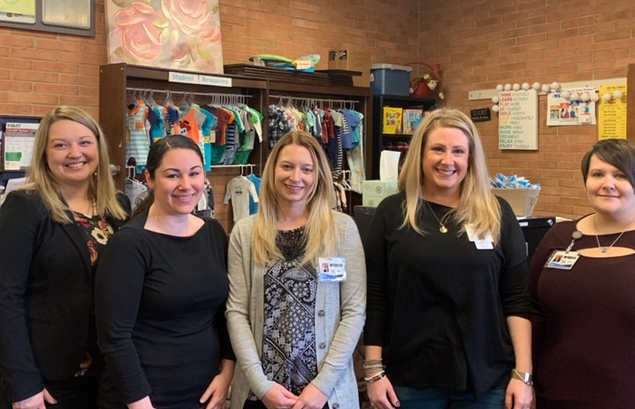 The ELECT Program welcomed representatives from Pennsylvania Department of Education (PDE), Pennsylvania Department of Human Services (DHS), and Center for Schools and Communities (CSC) for our yearly Monitoring Visit on Thursday, March 7th. The visit kicked off with introductions between the monitoring team which included PDE’s new ELECT Program Officer, Lisa Lockwood, Nichole Fischer of CSC, Morgan Williams-Fake of DHS and members of the IU’s leadership team including Dr. Steinbacher-Reed and Ms. Brooke Beiter, as well as ELECT Program staff Lynn Frey, Amanda Bremigen, Jessica Knight, and Lori Hutchinson. Pictured from left to right: Brooke Beiter, Director of Educational Planning, Lori Hutchinson, Human Services Intern, Penn College, Amanda Bremigen, ELECT Case Manager, Lynn Frey, ELECT Program Coordinator and Jessica Knight, ELECT Data Entry Specialist. 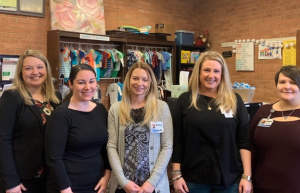 We are happy to report that the monitoring visit went exceptionally well and the IU’s ELECT Program was praised for their continued support of pregnant and parenting students. With a new Program Officer there will be many exciting changes coming and PDE indicated that many of those changes are already being reflected in the case management, data collection, and student programming work within our ELECT Program. We will receive an official review of the visit later in the spring. Starting on Tuesday, March 19th the ELECT Program will begin our Evening Education Series. This is an opportunity for program participants to come together from all of the different school districts and participate in educational events. The topics for these events were driven by student interest questionnaires that were completed at the beginning of the school year by program participants. Outlined below are the dates, topics, and presenters for each of the sessions. Tuesday, April 16th – Session 3: Head Start Opportunities, presented by Melissa Edmonds of STEP, Inc.
Last year’s series was a huge success in terms of student participation and engagement. We are looking forward to an equally successful series this year.